Wow, so like that weekend I also picked up a new Peugeot... a late 80s Canyon Express! It needs servicing and in fact I'm headed out in a few to take it to someone that will bring it up to spec for me. In the early 90's I found a used Peugeot Galaxie that had an aluminum frame made by Pechney. It had Shimano 105 components and it was super light. I paid $200 for it (it sold for well over $1000 new). It was definitely one to avoid, as the frame had a tendency to separate where the tubes butted together. My girlfriend at the time had laid it down, and shortly thereafter it separated (no injuries). I heard that there was a recall from the bike shop, but a Canadian firm had bought the name, so I was never able to make a claim. I ended up parting the thing out for the components. Yeah, from what I read, there were no breaks reported back in the day, but Peugeot opted to recall them anyway before pulling out of the market to avoid any legal issues if there were an incident. I just read that they did not use anything like adhesives or pins to hold it together. It looked to me like a simple fix of a screw with some adhesive. When I ran the idea past the guy at the bike shop, he looked at me and said, "Are you crazy?". I probably could have fixed it myself, but I didn't want to take any chances. The components transferred easily to a Cannondale frame. I like the idea of rebadging. It's not like a car, where everyone knows. It's a pity as there are some new automotive adhesives that would have glued those tubes stronger than welding would have, and it would have looked totally stock... I wonder if any have survived? 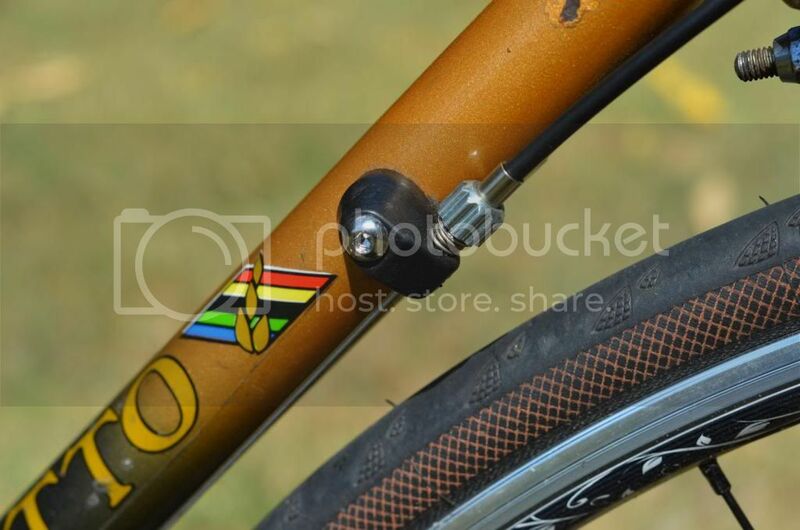 I've been trying to find pictures of my 1989' Mont Blanc Peugeot Road bike - I found it locally for sale, and the owner said he bought it in France while there in the late 80's. He rode it there and brought it back and it just stayed in the shed. It was French built and is very likely one of the last real Peugeot built bikes. Components are french as well - the only thing I did was re-grease the hubs, new handlebar wrap, and some Continental street tires so that it was a better commuter instead of the super skinny Michelin race tires. 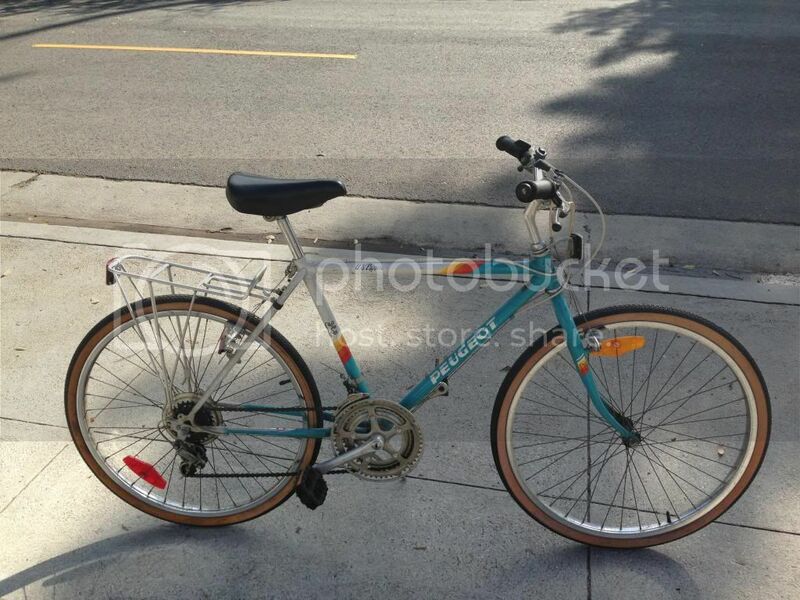 Bean, there's a guy selling a Galaxie frame with seat post and I think the bottom bracket on eBay for $300. I inquired about it, and the project is tempting... 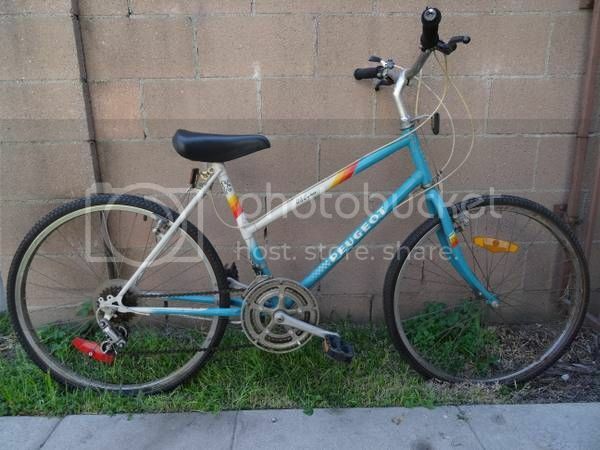 But just shelling out for the OE Shimano 105 set has to be a few hundred bucks alone, then it needs wheels, bars, and a seat. So for probably many hundreds of dollars I could end up with a very fresh sub-20 lb road bike that is perhaps one of a kind in North America. I'd love to do a resto mod road bike with and older frame and modern components an wheels... $300 is pretty steep - but if it was minty it might be worth it. Only issue I have with my Mont Blanc road bike are the old skool shifters on the lower down tube - although shifting while on the rollers really teaches you balance! forgot to add -- they're called down tube cable stops. 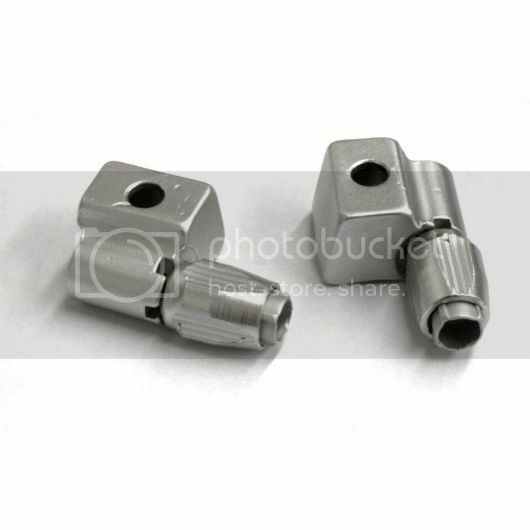 very popular for bike resto-mods. the upper ones are from a company called Velo Orange, they make nice stuff. the frame is straight, but the wheels and tires are thrashed so i was able to pick it up for very little (less than a nice restaurant meal for two adults). 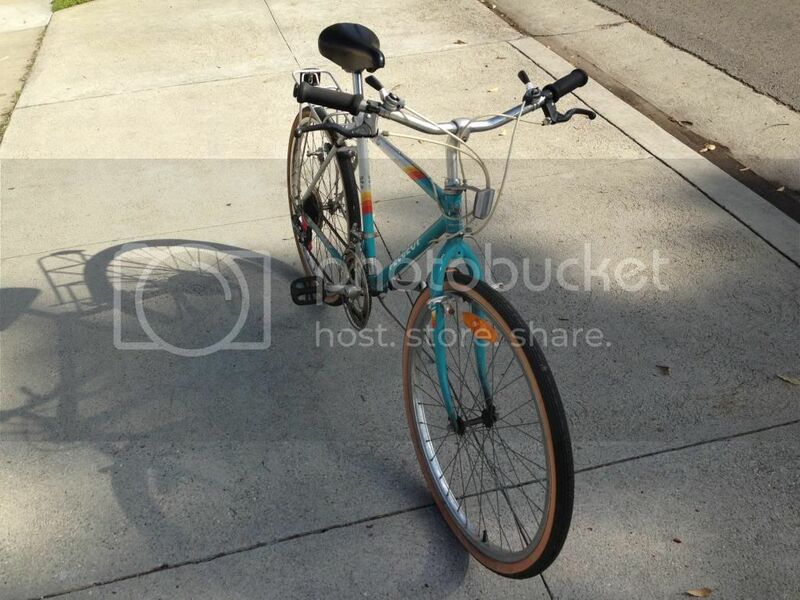 if you have a keen eye, you will notice that it's the same color scheme as my bike! i plan to have this one powder coated my wife's favorite color (purple) and get it sorted out for her. she doesn't know i have it yet, it'll be a surprise. I picked up a Peugeot road bike a couple months ago as well. I'll have to take some pictures of it. It's no 505 but it will have to do for now. Good to see you still pop in once in a while Evan! Andre - if you do powder be very careful about masking off / protecting any of the threaded bosses, or fitments like the steering stem bearings. Powder coat is great stuff, but is nasty to remove when needed, and is dimensionally much thicker than paint. Most of the bike restorations I've seen have used automotive grade spray bombs, or they've had body shops paint them up. My wife has this summer off, and once the roads clear I'll be putting my Peugeot bikes to use as well - I'll post pics when they come out of the shed for their tune ups. I still check in once in awhile to see what is going on and check the classifieds. There is a 505 wagon sitting in a driveway near where I work. It hasn't moved in 6 months, one of these days I'll leave a note on it and see if they want to sell. additionally, the front and rear dropout spacing on these frames is non-standard so i'm going to have the rear dropouts widened and replace the front fork; otherwise, standard wheels (which i've ordered) won't fit. all of the new forks are set up for the thread less headsets...this is shaping up to be fun project. rabin, the shop i use for powder coating is very good about masking off threads, etc. once when i was picking up one of my wheels, i saw the owner carrying a bike frame through the waiting area and i stopped him and asked him about bike frame painting. he showed me all of the steps they take (and told me how to prep the frame for them). so i'm confident they'll do a good job. 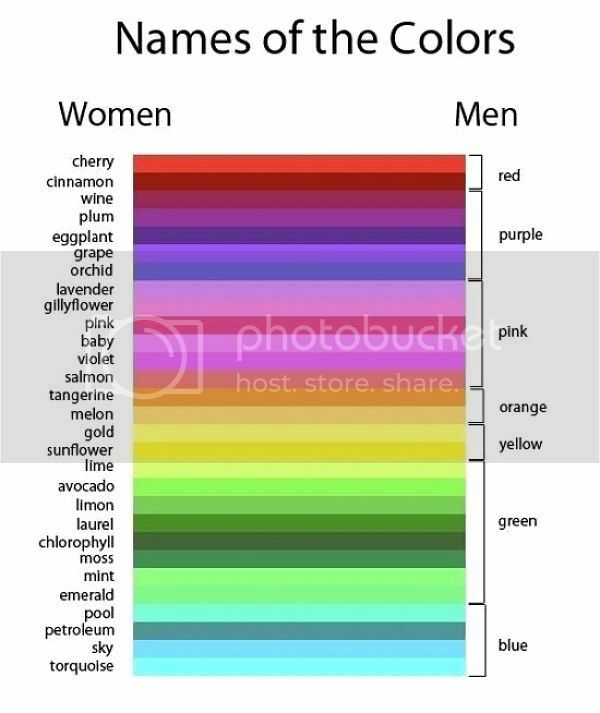 i asked my wife about what specific color purple she liked, and i got a long incomprehensible discussion. I'm guilty of a shamefully impulsive purchase. That Galaxie on eBay... talked to the seller and made a best offer bid. It was a fraction of his original price, and worth it IMO. I figure I'm the owner of a new project now. I've already located a complete used 105 groupset (biopace, but whatever I'm cool with that) in great shape but mavic wheels in so-so shape for $150 locally. That plus the frame and I'm still in for less than $300. 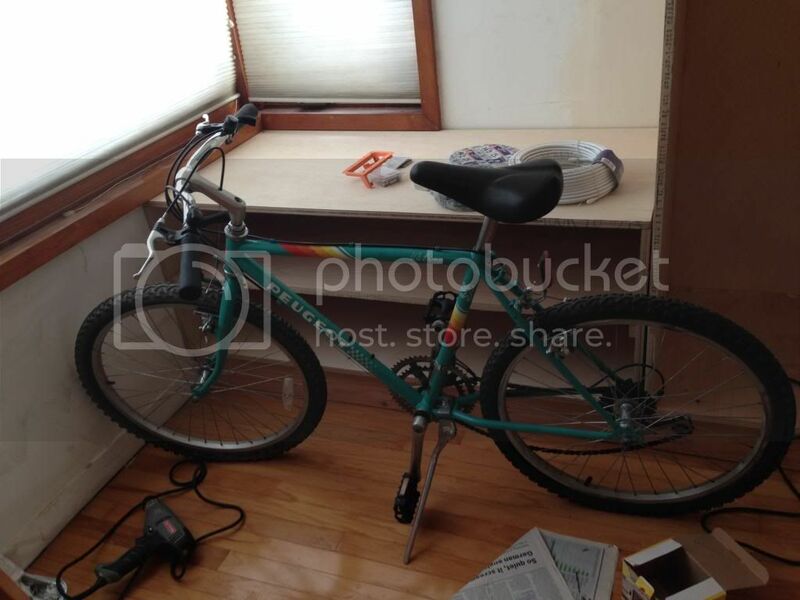 Just needs a saddle, bars, pedals, and rubber beyond that, and I'll be the proud owner of a 19 lb bike of doom. biopace -- sweet! very 80s. i had an ochsner race frame that i built up in the late 80s that had a biopace chainring...i got it b/c it was cool and new, but i never noticed any difference. many people claimed it gave them knee problems, but i was young and invincible back then so i never had any problems. Yeah, I've heard that too about knee problems. But then again others have said they had no issues, but that it really didn't make a huge difference. Still, I think it's a novel idea! I guess it never fully caught on. I really want to be able to ride it confidently, so I've been exploring different ways to make it more reliable. I thought about getting a very skilled welder to run a precise TIG around the seams, but then I'd worry about the heat re-tempering the Aluminum, or worse yet, blowing through the thin tubing. There are a few very highly regarded aviation grade Aluminum epoxies that might do the trick as well. I think I'd probably end up going the epoxy route. I read a thread online where someone did their own tests of various aviation expoxies. Several of them were so strong that the metal itself sheared before the joint came apart! It is a nice bike. So featherlight. As far as integrity, I think a problem can arise after the bike gets crashed. At least that was my experience. Mine separated where the down tube meets the head tube. It was still rideable. It would only come apart if I picked it up and never while riding it. Perhaps a set screw would really prevent it from popping out. There is plenty of material on both bars where they meet. I read that they didn't use anything like adhesives or welds. I probably should have kept it because I think the bike shop was skittish about frame repairs for liability reasons. I was able to recoup my initial investment. I'd go epoxy over tig any day - the latest automotive grade stuff is ridiculous, so I bet any alloy specific adhesive would be plenty... Clean up the joints after glueing and you'd never tell they'd been done. Look at what I found in a large box when I got home! This weekend I'm going to try to get the Shimano bits. Then I'll be more than halfway there.